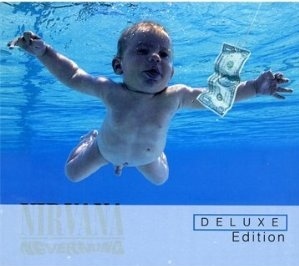 Nirvana and their 1991 album Nevermind turned the music world upside down. Twenty years ago, with this record, punk music returned with a vengeance and brought Seattle grunge to the masses. Historical context aside, Nevermind is a great punk record. Sure there’s the popular songs such as “Smells Like Teen Spirit,” “Come As You Are,” “Lithium” and “In Bloom”; but the non-singles stuff like fury of “Stay Away” and “Territorial Pissings,” along with the haunting ballad “Something in the Way” are on an equal plane with the recognizable stuff from the record. In retrospect, Nevermind wasn’t a record for punk fans–there’s something for everybody on this record, which attests to its popularity. And not to forget, Kurt Cobain’s disaffected and introspective lyrics add to the emotional and timeless quality of the record, echoed by the pain in his voice. The material on the second disc of this 20th anniversary reissue of Nevermind offers a revealing look of the music that would eventually end up on the finished album. The tracks from the Smart Studio sessions produced by Butch Vig were recorded over a year before Nevermind and featured Chad Channing on drums–his playing is noticeably different that Dave Grohl’s from these sessions—but the overall feel is remarkably similar to what was about to come; also noteworthy is the band’s cover of the Velvet Underground’s “Here She Comes Now” and “Pay to Play,” which would later become “Stay Away.” These performances carry the energy and vigor that would be replicated later on The Boombox Rehearsals recorded a few months before Nevermind’s release in September 1991. Even as rough-sounding demos, the band during these rehearsals launch into these versions of “Teen Spirit” and “Territorial Pissings” with energy and raw passion . In addition to the previously unreleased Tracks from BBC Sessions and B-sides paint a definitive portrait of the factors leading to Nirvana’s masterpiece, one that transformed music forever.